Over my years of keeping fish, something I have most definitely learned to be true is that fish have personality. Every fish is different and sometimes it is important to learn the habits and temperaments of your fish in order to provide them with the right type of care. Sometimes, you come across a fish that simply won’t work out in your tank, whether it be too aggressive, too shy, or just has a taste for coral ultimately the fish needs to be removed for the sake of the community in your tank. Today we are going to show you guys how to use a fish trap and provide some helpful tips that will take the headaches out of catching that pesky fish and getting it out of your tank! The fish trap we have at Marine Depot is one of the most effective traps I have come across and we carry two sizes. The smaller size measures 6″ x 3″ x 3.5″ and is perfect for smaller reef fish like Chromis, clownfish, wrasses and Damsels. The larger size measures 8″ x 6″ x 6″ and great for larger wrasses, dwarf angels and even smaller tangs. The traps have a removable bait container that holds food to bait the fish and is awesome because you can refill it without moving the trap. The strong suction cup will hold the fish trap against your tank wall making it easy to set in place without the worry of damaging anything in your tank. When setting the trap you want to place it in a location where the targeted fish will easily notice the food and naturally feeds. 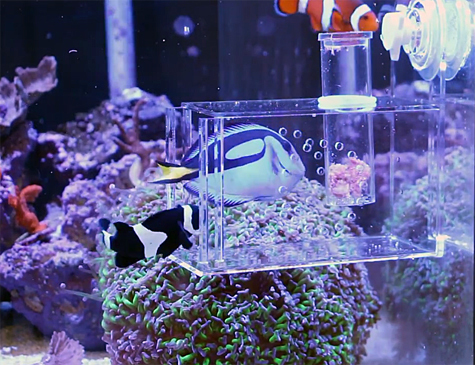 For bottom dwelling fish, it is best to place the trap on the sand and for fish that feed higher in the water column, you can suction the trap higher up in the tank. After placing the trap, fill the bait holder with the fishes’ favorite food, remove the door altogether and walk away. 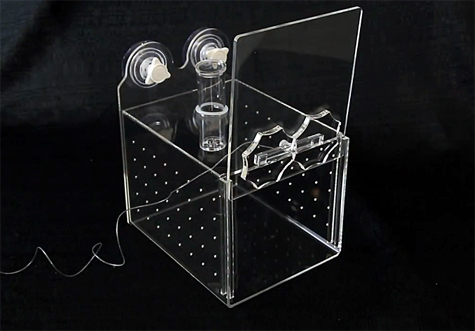 The trap will most likely intimidate fish in your tank and may take them a few hours or even a couple of days to actually feed from the bait holder so I found it best to just wait and not set the trap until you have observed the targeted fish feeding from inside the trap. This is especially important for finicky fish as the more aggressive fish in your tank will probably go for the food right away. Once you have observed the targeted fish feeding from the bait holder, it is time to set the trap and make your move. First refill the bait holder with some fresh food. The fish traps have a sliding door with a piece of fishing ling line attached and a small acrylic piece on the opposite end of the line. You will need to set the door open using the small acrylic piece and align it with the groove on the sliding door. Then find a comfy chair, grab the fishing line and wait. Once the fish is observed feeding inside the trap, pull the line and the sliding door will close and trap the fish inside. Now, I am not going to sit here and tell you this is easy and works every time. Fish are fast and smart and it will sometimes take you a few tugs on the fishing line to be successful but be persistent. Believe me when I say it is quite gratifying to finally catch that pesky fish that has been wreaking havoc in your reef. You can visit our website or follow the link in the video description below to pick up one of these clever fish traps and if you found our video helpful, please like and share it to help us spread the word. 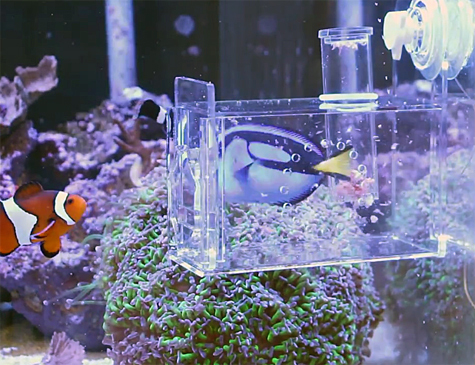 We appreciate all of you for watching and until next time, take care and happy reefkeeping. 4Shop for Fish Traps in our online store. 4Shop for Fish Containers in our online store. 4Shop Fish Nets in our online store.